More surprises on EASTENDERS this week as it was revealed Ian’s cafe actually has a toilet. Are we alone in never having noticed these facilities in the entire 23-year history of this soap? And yet suddenly, there they were plain as day. They even have dual male/female usage. Fancy that. 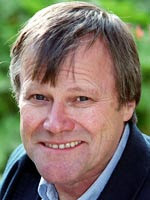 Ian was cross because his loos were being used by the zillions of police that have descended on Albert Square because of that hit and run accident with dear old Max. We were quite surprised about that too. Not Ian being cross. Or the hit and run. But all the police that turned up just for a boring old "attempted murder." We all know that Walford has played host to much worse crimes than Max’s hit and run over the years. And yet we never saw such vast numbers of police show up to investigate those, did we? Perhaps after all these decades, the filth have finally started wondering about why such a teeny tiny section of London should be at the centre of so many murders, deaths, rapes, brutal attacks, explosions, arsons, fairground accidents (can’t forget that one, tee hee) and blackmail attempts. Maybe there will now be an "Operation Queen Vic" to sort out this suspicious vicinity once and for all. And some of the leading "culprits" could be hauled in for a thorough grilling. Let’s clean up this area once and for all. Now we know Roy’s Rolls in Corrie does have a toilet because he’s so insistent about ke eping it clean. You could probably eat your bacon butties off that seat, although we don’t imagine Sally Webster would relish the attempt. In fact, Sally probably never allows the words "bacon butties" to cross her lips at all. Pancetta sandwiches, if you please. So Sally would be devastated to see the state her Rawsie’s been reduced to, in the attic at John Stape’s gran’s house. Rawsie, however, has managed to rise above five weeks of unwashed hair and severe lipgloss shortages to become a cool, chairleg-wielding type with Tombraider heavy-breathing. For the first time in years, we quite liked her. We also finally started to take to Stape, in his final throes with his hilarious explanations to his gobsmacked girlfriend about why he had an obnoxious 16-year-old locked upstairs, very much against her will. "It’s very comfortable up there," he protested to Fiz who, very reasonably, wanted to know why he hadn’t mentioned something before. The whole explanation took hours, making us feel very sorry for that elderly couple outside, locked in a taxi on their anniversary. "It’s not easy," he said, "when you’ve got someone locked in your gran’s attic."